The Venice Biennale may have passed from the headlines, but it's still running. And, just as the Film Festival is poised to pack Venice out once again, Luciano Benetton, the billionaire clothing making, is adding more than a thousand works from contemporary artists in Australia, India, Japan, South Korea, and the United States to the busy art scene. 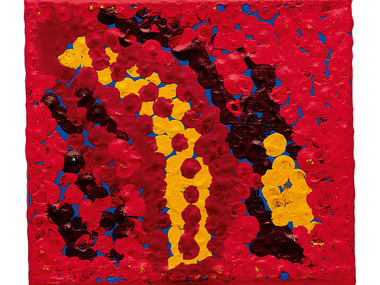 All of the Australian works are Aboriginal. In a heroic act of curatorship, Agathon Gallery man John Ioannou drove about 16,000 kilometres around the Western Desert and APY Lands to commission and collect 217 miniature artworks from today's finest painters in the remote communities of Warakurna, Wanarn, Blackstone, Mimili, Fregon, Ernabella, Mount Liebig, Yuendumu, Balgo, Kintore, Kiwirrkurra, Warburton, Warmun, Haasts Bluff, Hermannsburg, Tjuntjuntjara, Patjarr, Docker River, Mutitjulu, Kalka and Punmu. 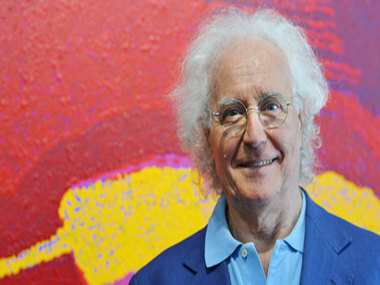 Luciano Benetton has always collected art - big, expressive paintings, many of which are by Aboriginal artists like Tommy Watson and George Ward Tjungurayi – but he had no thought of building what calls his Imago Mundi Collection until he retired as President of the Benetton Group, bought a yacht, and set out on a world tour. On his journey, he began to collect miniature art works, 10 x 12 centimetres each, that functioned as cartes-de-visite from the artists he met in places as disparate as Latin America, Eastern Europe, Russia, China, and Mongolia. Benetton, 77, is one the wealthiest men in the world with a $2 billion net worth, and has a soft spot for artists who are self-trained or operate outside the confines of a traditional art world. This not unrelated to the legend of his own life. At age 14, after his father’s death, Benetton went to work in a clothing store, until he sold his bicycle to buy his first knitting machine in the early 1960s. It would lead on to the world-wide brand, United Colours of Benetton. The “Imago Mundi” collection is now presented in five gridded display cases that fold up for easy shipping, each one devoted to a particular country. Benetton plans to take the exhibition eventually to every continent. “Through this project, we want to draw a geographical map of contemporary art all over the world in all countries, no matter whether they are topping the contemporary art charts, whether they’re close or far, or renowned from an artistic standpoint or not,” he said. The American collection includes works by musicians David Byrne and Laurie Anderson as well as a mixed media portrait of Brigitte Bardot by filmmaker Steven Soderbergh. Benetton plans to collect the work of 10,000 artists from 60 countries by the year 2016, including contributions from North Korea, Tibet, and several African nations. In Australia, John Ioannou admits that “The reaction of the artists to painting in such a small format required for the exhibition was predictably varied. None had been asked to paint such a small work before, and would really have preferred to have worked on a larger scale in keeping with their subject matter, which is usually an “abstract” rendition of the huge spaces of their country. However, in most cases, after several attempts, they fell into the spirit of the commission and completed a work to their satisfaction. And while some artists did reflect their usual styles, some didn’t. Instead, they responded with highly innovative, painting images that were related but quite different to the manner in which they normally paint”. 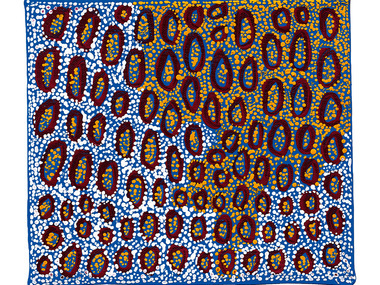 Artists from Australia include George Ward Tjungurrayi, Lance Peck, Lorna Ward Napanangka, Maringka Baker, Naata Nungurrayi, Ngoia Pollard Napaltjarri, Nyurapayia Nampitjinpa (Mrs Bennett) and Tommy Watson. The catalogue contains this fascinating, appropriately Italianate comparison from The Australian's Nicolas Rothwell. “A viewer, seeing these squares of stretched canvas, thinks of the minute predella panels that run beneath Quattrocento altarpieces. For these small works, in their intent and role, are much like the predella narratives. They show little fragments of desert landscapes and story cycles. They are echoes of the large-scale works of Aboriginal art from remote Australia; they are shards of colour, designed to draw and catch the eye. This, says the artwork, is the country. This is a rockhole or a range or a desert mesa, and also what happened there and the songs from there, and the tone and mood and intensity of that landscape and all the joy and grief it holds. And you must seek to sense it, grasp, it, tune into it, feel it; read its colours as a song, as much as a map”.